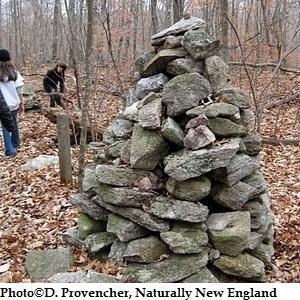 Parker Woodland is an 860-acre refuge extending into Foster, with majestic old forests, meadows and brooks, and mysterious piles of delicately balanced stones called cairns. Start on the easy orange trail from parking lot #1, and head right on the blue trail. You will go up a fairly steady incline and, as you descend the hill, look for the cairns. The tallest one has a large sign describing the theory behind these rock formations. You can turn around here, or if you’re up for a longer hike, continue all the way around the blue loop. Click here to visit the Parker Woodland website. 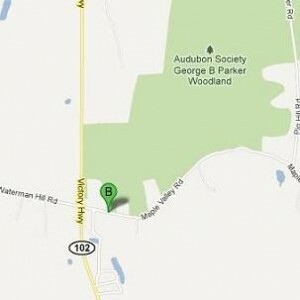 Get directions or follow ours: From Route 95, take exit 5B to Route 102 north. Follow Route 102 north for about 10 miles. Turn right (east) onto Maple Valley Road (across from Waterman Hill Road). Turn into the second driveway on the left by the Parker Woodland Wildlife Refuge sign.